This is a birthday card I made for my son. He loves all animals, but he is actually a cat person. 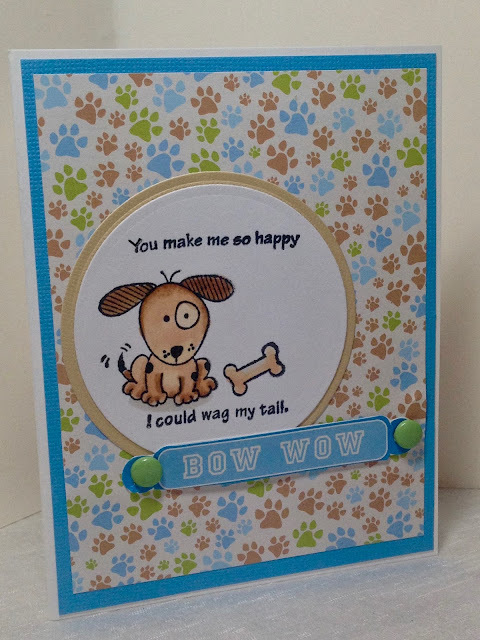 I knew when I made this card that he would say something about the doggie image, but I loved the sentiment so much I used it anyway. So sure enough, when he opened his present and saw the card, he said "Cute, but you know I'm a cat person". I replied "I KNEW you were going to say that! I made it for the sentiment!". Speaking of wagging tails, cats also wag their tails when happy and content...though not quite so vivaciously as a dog. I just returned home from an eleven day trip and I had to board my cat while I was away. Putting him in a kennel for that long was the hardest thing I ever had to do. When I dropped him off at the vet and saw him in the kennel cage he was trembling. It made me so sad I cried myself to sleep that night. I just returned home yesterday and when I picked up him up and brought him home he was quite traumatized. I don't want to get into all the details, but it wasn't good. Later that day, after a few hours at home, I noticed his personality was slowly starting to return to normal. He was laying on top of the stone fireplace, and I walked into the room and sweetly started to talk to him...and his tail started wagging! I knew then he was starting to feel better, and eventually, he accepted my affection and even came and laid down with me and cuddled. Oh, it was such a relief. I'm not planning another vacation until spring, and hopefully I can figure something else to do with him, because I don't know if I want to board him again! I made this card with one of those $1.00 stamps you will find in the dollar bins at JoAnn's Fabrics and Crafts. The paper and "Bow Wow" sentiment came from a DCWV stack called "Pets". 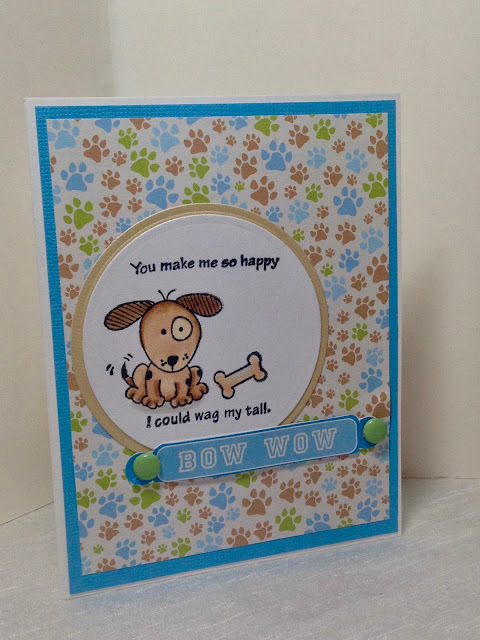 I cut the circles out with a Spellbinders Nestabilities Die and I adhered the "Bow Wow" sentiment with brads. And here is a picture of the birthday boy! 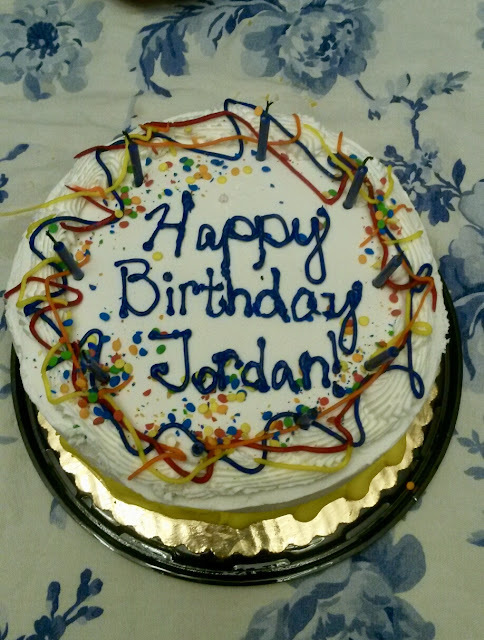 I couldn't be there on his actual birthday but I was so happy he received so much attention from his church family. 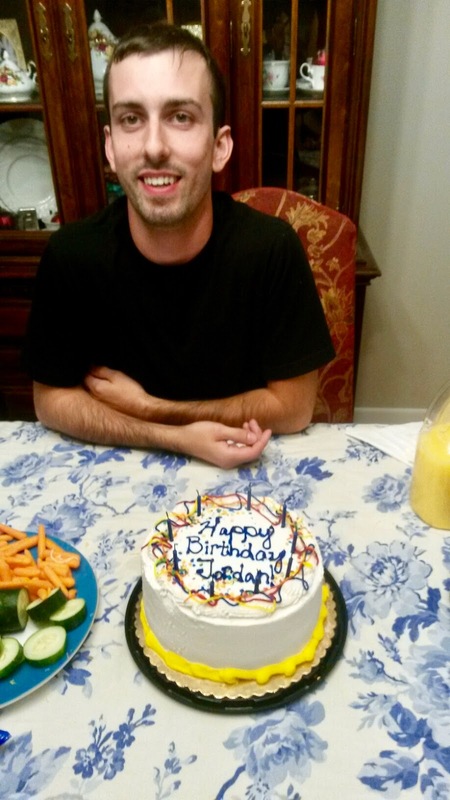 They threw him a party, bought him presents, and took him out to dinner. It's so nice to know that other people are loving your child when you are living far apart from one another. Are you a cat lover, dog lover, or both? I'd love to hear from you! Sorry to hear about your dear cat. I have one cat. He gets stress-related bladder problems (I'm told it's quite common in cats), which started after a trip to the States during which he stayed in a cattery So I switched to having a cat sitter stay in the house. I still occasionally have to deal with bouts, which are nipped in the bud with shots of Cartrefen and Convenia. But it sounds like your cat is back to his normal lovely self. Animals get treated with some pretty amazing speedy drugs. I sometimes find myself saying "I'll have what he's having"! Hope this helps and reassures you that help is at hand if needed. X. Thank you. Jackson seems back to his old self, but I don't think I can board him again. At this point, I don't know what I'm going to do with him next time I take a vacation. A cat sitter would be nice, but I can't think of anyone that would be willing to do that or that I could trust to lock up the house when they leave, not leave the water running, etc. But, my next vacation isn't until next spring, so maybe we'll find another alternative by then. 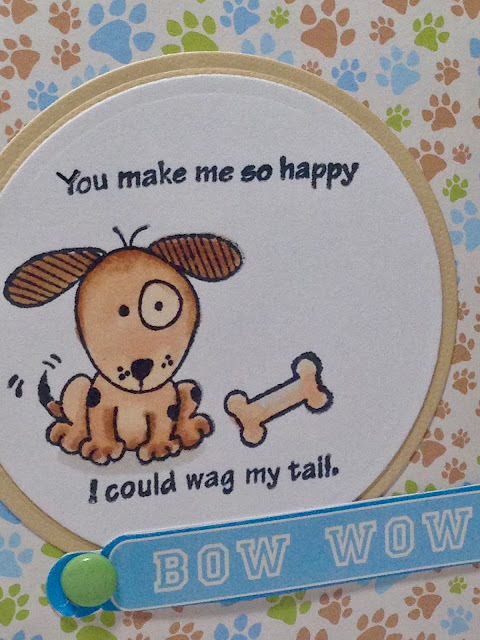 The card is really cute and love that paw print paper. It's been a while since I bought designer papers, might have to check out the DCWV line at Joann's (they are the only craft store in my town). Glad to hear kitty is doing better. I always hate when we leave our cats behind. We usually have my sister in law coming daily to feed them and check on them, because I also hate the thought of them in a cage. Now my sister in law is thinking about moving to another state, and I honestly don't know what we'll do then...I wish it was easier to travel with cats!! But mine even get traumatized from a short drive to the vet so that's never going to be an option. Thank you. The paper pad is so old, I'm not sure it's even available anymore. I bought loads and loads of designer paper when I worked in a craft store I will never run out! As for cats, ideally I think it's always best if they are left at home, but I don't have anyone that can pop in and check on mine either. I don't think I'll ever kennel him again though. I'll figure something out! You are so sweet to make these cards for your loved ones! Awww, your poor cat! We have two cats and are lucky enough that my parents can come over and check on them, but I am not sure what we'd do otherwise. Cats can be so scared and stressed over new places, it is hard. Hopefully you can find someone to check in on your cat at your house or something next time around. Glad your cat is doing better, tho!